"The New Beverly crowds are genuine, they're there just to love cinema." How do we save 35mm film? By cherishing it, archiving it, and reminding the world of its existence with screenings and events that herald the soon-to-be-long-lost-format. One of the latest documentaries about this technological evolution is titled Out of Print, a film two years in the making from New Beverly's Julia Marchese. The doc focuses on the New Beverly Cinema in Los Angeles and the many people who make it their home. She has interviews with people like Edgar Wright, Patton Oswalt, Rian Johnson, Joe Carnahan, Kevin Smith, Joe Dante and so many others. The first trailer is out and it's all about a love for cinema, its many joys, and repertory theaters. A documentary exploring the importance of revival cinema and 35mm exhibition - seen through the lens of the patrons of the New Beverly Cinema - a unique and independent revival cinema in Los Angeles. 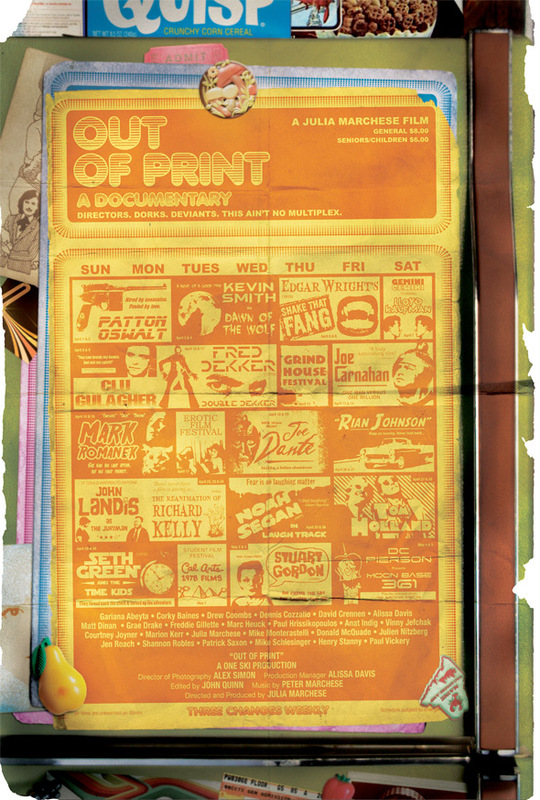 Out of Print is directed by film lover Julia Marchese (@newbeverlyjulia), who explains on the doc's website: "The New Beverly Cinema is a movie theater in Hollywood, CA that has been showing revival (not first run) double features 7 nights a week since 1978. Theaters like the New Bev are well-loved treasures that need to be preserved right along with the films that they show, but there's a threat on the horizon… The digital revolution might end revival cinema as we know it." Below is their poster riffing on New Bev's own calendar. As of now, Out of Print doesn't have a release date but will be premiering at various upcoming film festivals. This sounds fantastic. I am not a huge proponent of film, but I do see its merits. Very happy to see this finally completed. I've been a patron of the New Beverly for years. They've provided some of my best moviegoing experiences. Edit: I'm actually surprised we don't see Tarantino anywhere. I'm pretty sure he owns it still.